We had a wonderful holiday at Villa Eleni. The villa itself is absolutely stunning, the architecture and design really taking advantage of the beautiful sea views. The pool, balconies and terraces, so well laid out. As well, Nikos, the owner was so kind and friendly, we looked forward to seeing him when we could. He tried to make our stay problem-free and was so quick to answer any questions we had. We highly recommend this villa to anyone thinking of going to Greece and getting away from it all. Thank you so much Nikos! We will be back! Villa Eleni is a spectacular villa. We found it to be very comfortable and relaxing. We particularly enjoyed the outdoor spaces; there are four individual terrace/patio areas where you can eat, drink, relax, take a swim or enjoy the sunset. Inside, everything is very well laid out, convenient and high quality (including the soap/toiletries provided). Having a piano was a real bonus. It is a short drive from a small beach and a couple of fish tavernas. We visited the Waves on the Rocks taverna a few times and it was very good. For dinners we usually prepared something simple at home in order to take advantage of the sunset views looking out across the water towards the Gravmousa peninsula. The owner was very helpful and nice. We are looking forward to another trip hopefully next year. Also, we loved the swimming, hiking, food and culture of Crete. We traveled with our 6 months old daughter to spend our first vacation with our daughter in Greece. Because it was our first vacation with the 3 of us I wanted to go somewhere special... And our stay at Villa Eleni was nothing short of spectacular!! 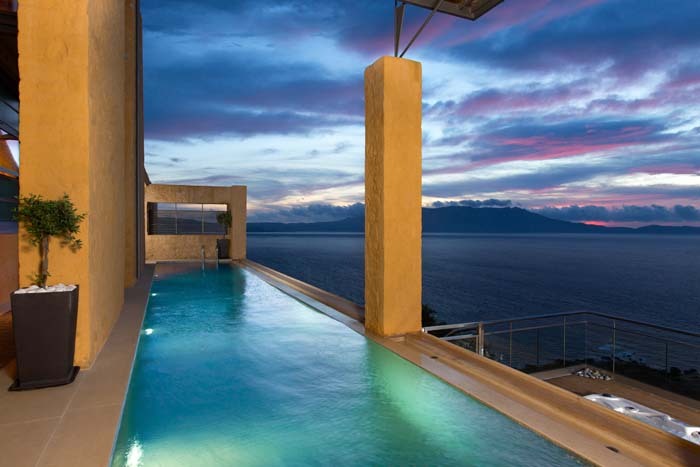 The house itself is beautifully set-up and located on a hill overlooking the bay of Chania which produces amazing sunsets. The house is fully equipped with everything one could possibly need and the friendliness of both the owner and the agent was impressive. They have not only welcomed us and made stay as comfortable as possible but gave us also great tips for places to see or restaurants to eat at. All that being said, our preferred place of all was a small taverna at the tiny beach at the bottom of the hill. Just 5 minutes by car and you will find one of the coziest bays you can imagine (only downside is that it's not a sandy beach but has small stones). For us it's just a matter of time before we come back and once again stay in one of these two amazing houses! The house is remote and yet in the neighbourhood of interesting villages. Chania. a charming place, is only half an hour driving. The architecture of the villa is modern and very special. We were most cordially received by the owner, with little presents. All rooms had television, and there was internet connection available by satellite. Beautiful terraces and sunny from around ten o'çlock in the morning (this was in winter). Sunsets were amazing. We had a marvelous time. We had a wonderful week this summer in Villa Eleni! Home has a great, modern, natural & smart design. We feel comfortable here as at home. Best of all - picturesque view from all terraces! The home is clean and has everything you could need and is close to most West Crete attractions. Great service from the owner Mr. Nikolas Manousakis and manager Kostas. We went to the "world famous" beaches-Fallasarna and Elafonis, but forget about them - the nearest beach Ravduha much better than the dusty and noisy famous beaches. Chania - a beautiful and friendly town in the Venetian style, is 20 minutesdrive away and can offer a good selection of restaurants and entertainment. Ask the owner - he knows a lot about this.